We offer a complimentary bike sizing with every bicycle purchase from us. We work with you to suggest the best bicycle for your needs and adjust your seat to an appropriate height based on your leg and knee extension. 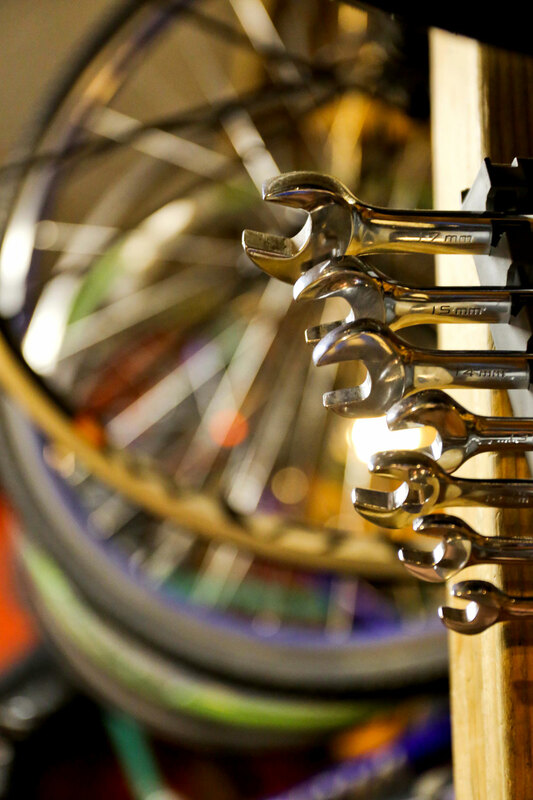 We also offer free minor (on bike) adjustments forever with each bike purchase, such as: rising/lowering stem, adjusting seat position (not just height, but fore and aft) rolling handlebars, brakes, grips, etc. All these tiny adjustments add up to a better, longer, and more comfortable ride. We offer the following for those who would benefit from a more in depth fit, where we take into consideration your personal riding style, fitness, flexibility and overall body morphology. The Basic Fit ($25) delves a little deeper into saddle and handlebar/stem adjustments on your bicycle. We will swap out your stem and/or saddle, with one from our saddle/stem library. From there you can demo them for up to 7 days. If it's still not right, we'll switch them to another from our library until you've found your best match. At the end of your demo, you may apply the $25 to the purchase of a new saddle and/or stem of your selection. The Regular Fit ($45) involves a more detailed rider interview, and biometric analysis. Expect to ride on our trainer for 1/2 hour to 1 hour, so that we will be able to make adjustments and suggestions for saddle, handlebar, shoe/cleat alignment based on our expert observations.